Old Little Helper would run my garden automatically. ;Planting and collecting Gold EVERY HOUR. It would run 24 hours a day until it ran out of seeds and I purchase more. Which was a;HUGE HELP during Tycoon;and the only way I\'d barely place in the rankings. Now it tries to collect Tree Blessings and;STOPS COLD. Which means that it;owes me for the 24,640 gold (lv2 small) x8 PER HOUR;since the update. Well, FIRST, to plant seeds OTHER than gold, you need to do it *manually*, as (old) Helper would start with any gold seeds you have in inventory Before other seeds. THE POINT IS… no matter the seed type, this NEW (bleech!) Helper is;NOT;doing the same job as the old, it is;NOT;harvesting and replanting automatically. It tries to harvest the world tree blessings, sees it already done, and STOPS COLD. Dear player, I will make a report on this. I too agree lil helper needs to be programmed better. I will push for it to be cleaned up and working properly at our next meeting. Thanks! I will ask about this. Yes, it will be too late this Tycoon. Devs already home for the weekend -_- But i\'ll see what I can do. I do think that new little helper doesn\'t does same job as old one. If you want to, u can try something. - start garden little helper once, it collects gold and blessing stuff. Then stop it. Then start again and it will plant seeds. I do this to plant seeds everytime. Thank you. I\'ve developed workarounds, but it still requires *me* to be there instead of automatically working while asleep or out of the house. 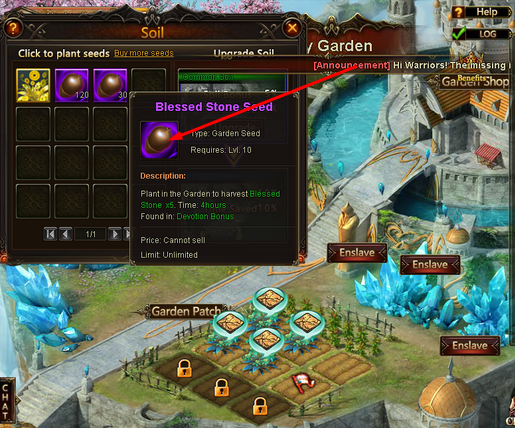 BTW, as long as you still have World Tree Blessings to build, Helper will work the garden; harvesting and replanting. It will not touch the Lover\'s Tree, or collect rewards. But once World Tree hits 10/10, it stops cold. Doesn\'t collect though. 2019-4-22 16:52 GMT+8 , Processed in 0.055121 second(s), 46 queries .